Over $800,000 saved in a KaiNexus WorkOut! 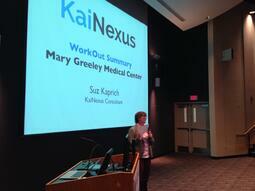 In May 2014, MGMC completed a KaiNexus WorkOut that resulted in significant cost savings, revenue generation, and time savings. Learn more about the KaiNexus WorkOut process here. Back in December, Mary Greeley received the “Gold Achievement” recognition from the Iowa Recognition for Performance Excellence (IRPE). That's the state level award for the national Malcolm Baldrige National Quality Award and it's really impressive. Karen was interviewed by our Mark Graban in episode #218 of his Lean Podcast series about how Lean and other continuous imrprovement strategies were key to their Baldrige success to date and their future goals of national recognition.